Searching for a wine cooler that is reliable and offers great value? Avanti’s thermoelectric countertop wine cooler is a fantastic choice. It features a double-pane, sleek black design with an insulated concaved front glass door and three full-width chrome wine shelves. And with its sleek, modern look, it’ll look great in virtually any kitchen. Whether you place it alongside your refrigerator, on the countertop, or installed into a cabinet, this cooler adds style while keeping your prized wines at just the right temperature. The Avanti thermoelectric wine cooler is free standing and measures at 25.25″ (64.1 cm) x 10″ (25.4 cm) x 20.25″ (51.4 cm). As a freestanding model, it’s meant to be a standalone unit, but you can always incorporate it into your kitchen in place of a cabinet as long as you provide sufficient space for the unit to vent. Though it’s compact, it can easily fit 12 bottles. It stores up to four open or closed wine bottles vertically and up to eight closed bottles horizontally. It’s also light-weight at only 27 lbs (12.25 kg), and has a single temperature zone that ranges from 47F (8.3c) – 64F (17.8c). The Avanti wine cooler’s thermoelectric cooling system is vibration free and ultra quiet. 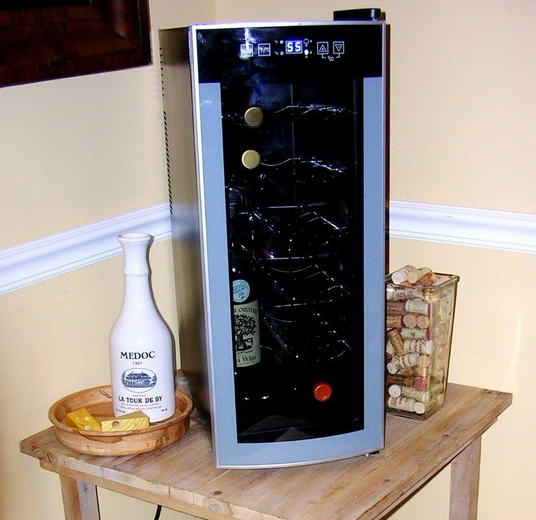 The advantage of it being vibration free is that your wines will sit totally undisturbed. Other cooling systems may project micro-vibrations through your wines putting them at risk of oxidation and possibly compromising their quality. This wine cooler is one of the most popular options on the market, but like any other product, it’s not flawless. Here are some of its pros and cons to help you make an informed decision. First, the upsides. It’s very affordable. Compared to other coolers on the market, this one offers excellent value. You can take comfort in knowing that this product is a good buy for the money. It’s easy to operate and user friendly with soft-touch controls and a digital display. It has an attractive, elegant appearance. Its concave door and platinum finish offer a modern look that will compliment any bar, kitchen or dining room. Your wine’s sediments won’t be disturbed with its vibration free refrigeration system. The thermoelectric cooling system also allows it to runs pretty quietly, but not totally silent. You can keep bottles standing upright inside the cooler. This allows you to keep bottles that are already open at the proper temperature should you decide to return them to the cooler. The shelves are removable, so if you have some bottles that are taller than average, you can remove the second shelf from the top to make them fit. It’s pretty compact and saves space. Larger coolers can be a bit overwhelming, but this one is conveniently sized. The Avanti 12-bottle wine cooler clearly has many pros, but here are also some of the downsides that should be considered before making your decision to buy. This cooler stores standard, 750ml bottles. The bottom three shelves stand in one piece that can’t be removed to allow bigger bottles like 1.5 liter or champagne bottles. The controls have a lock out feature which also controls the interior light. You need to hold the temperature control switch for a few seconds, then press the light switch to turn the light on. This can get annoying as you probably won’t want to have to go through this step. The slots of the metal shelves cannot fit bottles that are wider and taller than standard sized bottles including long-neck bottles even though they may still be only 750ml. The Avanti wine cooler is sensitive to ambient temperatures. It is limited to cooling between 20F– 25F of the room’s temperature. Wide swings in ambient temperature will cause equally dramatic swings in the cooler’s temperature. If the temperature in your home tends to stay relatively constant, then this of course won’t be an issue. It’s single-zone and lacks the ability to store both red and white at their respective optimum temperatures. If you enjoy both and want to store both in a cooler, dual zone might be a better option for you. The fan can be heard when the cooling system is active. You will be able to hear it gently running. Some people find this light background noise more annoying than others, but few coolers don’t make some kind of sound. Although the Avanti countertop wine cooler has a compact size, it still requires some space on all sides for airflow. This is less of a specific con about the Avanti countertop wine cooler than it is about thermoelectric wine coolers in general, but it should be noted that it still requires breathing room.